Over 40% of our customers are getting at least one ADT Pulse camera with their ADT monitored security system. The integration with remote interactive services from mobile Apps and the affordability of these cameras are making them extremely popular. Many customers are asking if they are comparable to professional grade video surveillance systems. Well... no. Let's check out the differences. An ADT Pulse camera can be programmed to record 30 second video clips. These clips start recording when a triggered event occurs that you have setup in your ADT Pulse Web Portal. The most common triggered event is when there is motion in front of the camera. You can setup each of your ADT Pulse cameras to record a 30 second video clip each time there is motion in front of the camera. Once the 30 second clip is recorded, it takes several minutes before another 30 second clip can be recorded due to motion. Several other common triggered events that record 30 second videos are any alarm emergency events, system being armed or disarmed and when doors open or close. You can also view live video at anytime from a mobile device with the ADT Pulse App or from a computer from the ADT Pulse Personalize Web Portal. As you are watching the video, you have the option to press a button to record a 30 second video of what you are viewing or you can just snap a picture. Obviously, if you want 24 hour recording of video you will need to invest in a professional grade video surveillance system. Most of these systems have a DVR (digital video recorder) which can record video from several days, weeks or months depending upon the hard drive of the DVR. One thing to consider is that if a thief steals the DVR, they are taking all the evidence of the burglary. ADT Pulse cameras store the video in the cloud so you will have the recording no matter what video equipment the burglar steals. One of the best benefits of getting ADT cameras, is that you can program to receive a notification of any motion that occurs in front of an ADT Pulse camera. One of the most important locations to have an ADT Pulse camera installed is at your front door. You can program to receive a text or email notification anytime someone comes to your front door. Over 50% of all break ins occur through the front door. So it is very important to have extra protection at this location. Many of us are also receiving more package deliveries than ever with all the online shopping. It is great to get a text when the delivery is made. And more importantly, to see if anyone comes to the front door trying to steal your deliveries. By adding cameras to view the front yard, backyard and the sides of your home, you will be able to setup your system to notify you any time someone enters your property. This gives you a lot of peace of mind knowing when anyone is on your property before they break-in. With a professional grade video surveillance system, it depends upon the DVR if you will be able to get notifications of motion. With most DVRs you are able to connect them to the Internet which allows you to watch live video remotely from a computer or mobile devices. Most DVRs do not send text or email notifications of movement in front of the cameras. The ADT cameras with Pulse monitoring service, depend upon WiFi and the reliability of your Internet service. Both your Internet service and WiFi can go down from time to time. If your Internet service goes down, then you will not be able to see live video from your ADT cameras or get any recorded videos. 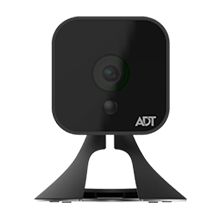 ADT Pulse cameras also rely on WiFi to send video from the cameras to the ADT Pulse Gateway Hub that connects to your Internet to send record videos to the cloud for storage up to 30 days from the video event. WiFi does have its problems at times and interference from neighbors close by can cause WiFi issues depending upon what channels you are both using. ADT Cameras also have to reset before they can record another 30 second video clip depending upon what triggered events you have programmed to record video. It takes several minutes before you will get a second 30 second video recording from motion in front of the camera. This creates a lapse of time between recordings which may cause you to miss video recordings that you would like to see. Professional grade video surveillance systems with DVRs will record all of the video. They do not rely on your Internet or WiFi to record the video. If your Internet goes down, you will not be able to see any videos remotely, but your DVR will still be recording all the video. The main concern with recording video to a DVR is if the DVR is stolen you will not have any of the recorded video. One of the reasons ADT Pulse cameras are so popular is because they are amazingly affordable. You get a free indoor camera with your ADT Pulse Level III monitoring service. Additional ADT indoor cameras are $199 and outdoor cameras are $259 with installation. You can often find specials or coupons to reduce these prices. You will need to have ADT monitoring service to continue enjoying the benefits of your ADT Pulse Cameras. Video surveillance systems with DVRs are often more expensive than wireless WiFi cameras. Most systems including installation start at around $2,500 but often are between $3,500 and $4,500 for a four camera system. You can buy an eight camera system with DVR from Costco below $1,000, but you will need to install it yourself and be prepared to replace it with a new system in several years. ADT Pulse cameras are under warranty for parts and labor as long as you continue the ADT monitoring service. Video surveillance systems with DVRs typically have a one or two year warranty on the equipment. Some high quality and expensive video surveillance systems have five year warranties on the equipment. With a DVR system you will pay for the service call if you need replace of your video equipment. At the office, we do have a video surveillance system with a DVR and I like having the recorded videos of every event that happens. Every homeowner and business owner must personally decide what they want and what works best for them. I do believe that cameras should be an addition to a monitored security system for both homeowners and businesses.